In October 2014, a steering team was established to conduct an independent review into the circumstances surrounding the death of a student inside North Albion CI. 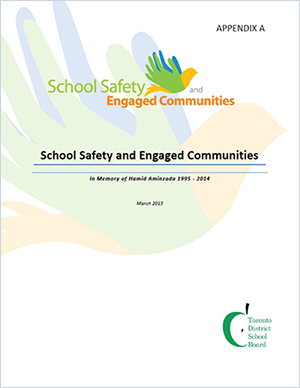 In addition, the team also reviewed how the TDSB can be responsive and current to best support safety and care for all students and staff, both before and after critical incidents. The steering team consulted with over 500 people and held two public community forums and received over 35 written submissions from staff and members of the public. Though tragedies such as this are difficult for all of us, we continue to work together to tackle the complex issues that result in community violence. Students feeling safe in school is an important part of student success and the fact that so many students feel safe at school is a direct reflection of how we are intentionally building positive school spaces. This is reinforced by board-wide results from the latest Census that tell us 93% of students feel safe in their schools. The creation of safe school committees in all TDSB schools. Positive school climate surveys and census data to inform programs and support. Fostering strong community partnerships to support students and their families inside and outside the classroom. The establishment of the gender based violence prevention office. Clear policies, procedures and training for staff on how to manage serious incidents. Secure entrance systems at all elementary schools. "The notion of collaboration is key in the report. Whether it’s collaborating more with the city, community service organizations or Toronto Police, this report provides a series of recommendations for the Board to makes its schools even safer." "Together with staff, Trustees will now look at the 41 recommendations and determine how we can address each one. Some recommendations can be addressed by the Board itself, while others will require greater community involvement to address the underlying causes of youth violence." "I want to thank the community for the thoughtful comments they provided. From this report it is clear that we need to do more to reach out to the larger community beyond the schools where our students spend their days." "Whether it’s crisis response and school environments or polices & procedures and community engagement, the recommendations reflect many complex challenges staff have also identified and that we are in the process of addressing as a system."